Wakenby Limited (to be renamed Roman Kings Ltd) ACN 120 394 194 issued a supplementary prospectus dated February 13, and was lodged with ASIC on that date. The Supplementary Prospectus is intended to be read with the prospectus issued by the Company dated 5 December. The offer will now close 26 February 2018 - the new indicative timetable for the Offer is as per below. Roman Kings is an exploration company with licenses located within the Leonora region of Western Australia which are prospective for gold, other precious metals, and base metals such as nickel, copper and cobalt. 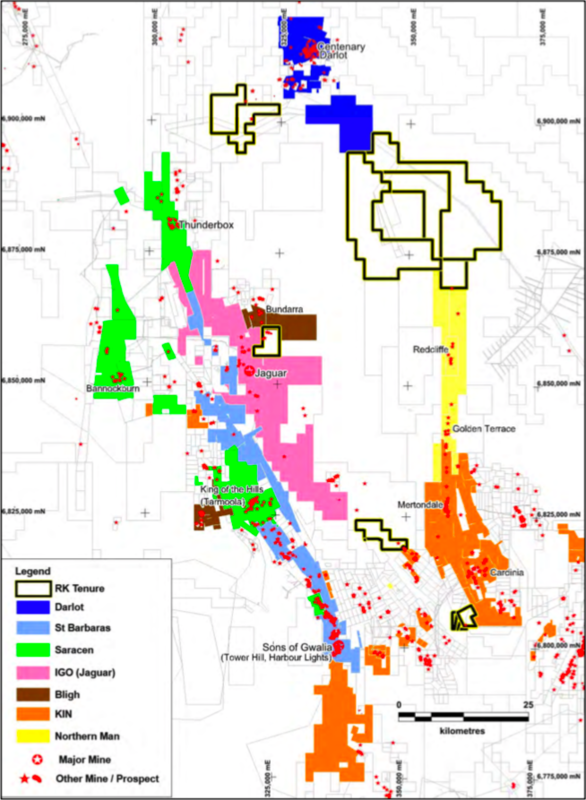 This key Goldfields region is a geographic focus for the company, alongside developing junior and mid-tier gold companies such as Dacian Gold Ltd (ASX: DCN), Saracen Mineral Holdings Ltd (ASX: SAR), Red 5 Ltd (ASX: RED), Ardea Resources Ltd (ASX: ARL), Kin Mining NL (ASX: KIN) and St Barbara Ltd (ASX: SBM), enabling value to be derived from regional success. The centre of the Roman Kings package lies within a 100km radius of six gold mills, of which three lie within a radius of 50km – this is a strategic focus, with multiple processing facilities to supply. Wakenby Limited (to be renamed Roman Kings Ltd) ACN 120 394 194 has issued a Prospectus including a Public Offer, which can be accessed by clicking ‘Download Disclosure Document’ on this page. This is an important document that should be read in its entirety, paying particular attention to the key risks (section 4). Wakenby Ltd is an ASX listed company which is currently suspended but operates under the ASX ticker code "WAK". On 8 November, the Company announced that it had entered into a Share Purchase Deed to acquire 100% of the issued capital of Roman Kings. Upon completion of the Proposed Transaction, the Company will trade under the ticker code "RKG". Note that an Extraordinary General Meeting was held 11 December 2017 by Wakenby Limited, where all resolutions were passed, including approval of the Proposed Acquisition of Roman Kings Ltd. Following the completion of the Proposed Transaction, the Company proposes to rapidly advance the exploration and development of the Tenements. The Public Offer is for a minimum of 25,000,000 New Shares at an issue price of 20 cents ($0.20) per New Share to raise $5,000,000 and a maximum of 35,000,000 New Shares at an issue price of 20 cents ($0.20) per New Share to raise up to $7,000,000. The Company is raising this additional capital to fund the exploration costs and working capital requirements of the company, meet costs associated with the Proposed Transaction and the Offers and assist the Company in re-complying with Chapters 1 and 2 of the ASX Listing Rules. The Tenements are located near the Leonora Region of Western Australia and may be prospective for gold, other precious metals and base metals such as nickel, copper and cobalt. The Tenements are geographically focussed and can be considered as a single large project area located between Leonora, Laverton and Leinster, consisting of 731.7km2 in area. Exploration and development in the Leonora area has been largely stagnant until recently due to the recent mining downturn. This has left highly prospective areas unexplored or poorly defined as larger holders relinquished tenure to mitigate global economic pressures. Operating miners in the area include a mix of larger miners with projects nearing the end of their life, mid-tiers with projects in ramp-up phase and juniors with projects still in development. Acquisitions in the region (refer to the figure below), such as the Thunderbox Project by Saracen Mineral Holdings (ASX: SAR) and the Mertondale-Cardinia Project area by Kin Mining NL (ASX: KIN) as well as the proposed acquisition of the Darlot and Kings of the Hills Projects by Red 5 Limited (ASX: RED) has seen activity and interest in the immediate region greatly increased. Roman Kings plans to actively seek ways to enhance its assets via access to further development or consolidation opportunities in the area. The success of the Company’s business following the completion of the Proposed Transaction is directly related to its future mineral exploration activities. The profitability (if any) of the Company’s exploration activities will be dependent on the success of the results of exploration on the current and any future exploration assets of the Company and, if possible, the successful commercial exploitation of these assets. 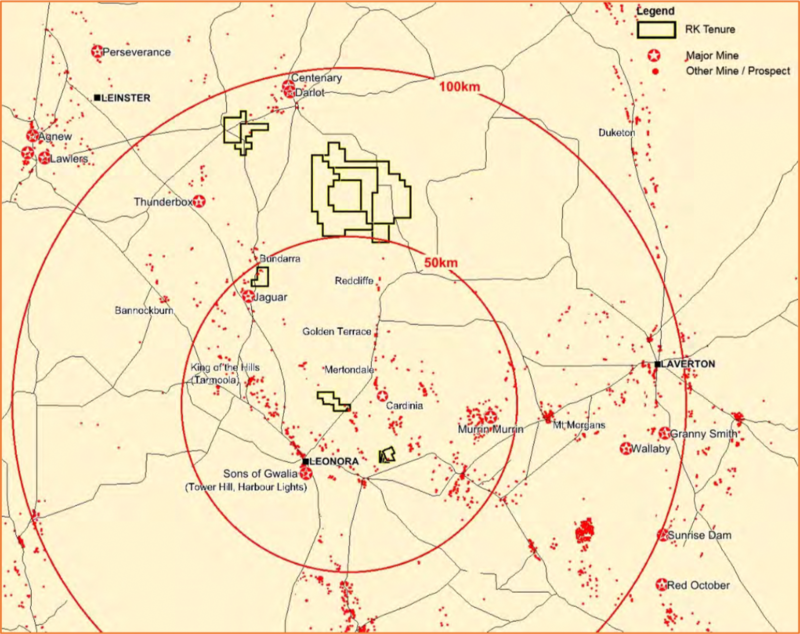 Roman Kings is focussed on the exploration and development of gold mineralisation, however the Tenements are also prospective for zinc-copper mineralisation (analogous to the Teutonic Bore deposits along strike including the Bentley and Jaguar mines) along with ultramafic hosted nickel sulphide mineralisation. While these commodities are not a primary focus for Roman Kings, where exploration is carried out in areas prospective for these metals, exploration best practices will be followed to ensure no opportunities are missed. The recent development of an initial maiden Inferred Mineral Resource by Roman Kings on a Mining Lease (Crawford) allows the potential for early cash flows resulting from mining. As indicated above, the area contains multiple processing facility options, many of which are likely to require additional ore supply over the medium to long term given the potential exhaustion of their current supply. The Disclosure Document contains detailed information about the Offer and the tenement assets, financial position, operations, management team and future plans for the Company following completion of the Proposed Transaction. Potential Applicants should be aware that an investment in the Company involves many risks, which may be higher than the risks associated with an investment in other companies. Potential Applicants should read the whole of the Disclosure Document and consult with their professional advisers for legal, business, financial or tax advice in order to fully appreciate such matters and the manner in which the Company intends to operate before any decision is made to apply for Securities. Investors who would like to acquire the securities will need to complete the application form which will be in or will accompany the Disclosure Document (which can be done via the electronic application form which will become available by clicking the ‘Download Disclosure Document’ button above). * The above timetable is indicative only. Roman Kings has a substantial land holding focussed on prospective geological settings, in close proximity to proven mining projects situated on or along the same anomalies, that have not been properly explored or developed. The total tenement package is one of the largest in the region at 731.7km2. Inferred Mineral Resource at the Crawford Deposit situated on a Granted Mining Lease, allowing for the potential to generate early cash flows. Strong and flexible project portfolio, containing seven (7) project areas with ground that ranges between new discovery, low cost resource upgrades and near mine potential prospects. Geographic focus in a key Goldfields region alongside developing junior and mid-tier gold companies such as Dacian Gold Ltd, Saracen Mineral Holdings Limited, Red 5 Limited, Ardea Resources Ltd, Kin Mining NL and St Barbara Ltd, enabling value to be derived from regional success. Strategic focus with multiple processing facilities to supply; the centre of the Roman Kings package lies within a 100km radius of six gold mills, of which three lie within a radius of 50km. Experienced management and technical skills in-house – Roman Kings contains a cross section of mining professionals covering multiple disciplines with substantial experience in the WA Eastern Goldfields Region. Proven management team with the necessary skills set to progress exploration and accelerate potential mining development of its projects. Well connected – substantial network of suppliers, drilling and mining contractors, consultants and resources professionals. At completion of the Proposed Transaction, the Company anticipates that its free float will be not less than 20%. Initially the company's strategy is to conduct exploration programmes on the tenements and seek to drive capital growth for Shareholders through achieving success from these programmes. implement a growth strategy to seek out further exploration, acquisition and joint venture opportunities in the immediate vicinity. The Directors are satisfied that on completion of the Offers, the Company will have sufficient funds to carry out its stated objectives.